With environment protection being the rage these days, not as just a passing fad but a genuine problem to be addressed, many entrepreneurs have taken up the challenge to alter the situation as is within their capacity. Converting the infrastructure to accommodate environment friendly standards is a sound business move that brings in rich dividends for the organisations concerned. Surveys conducted confirm a more positive attitude prevalent towards hotels that are eco-friendly and these hotels are termed ‘ecotels’. They have to undergo stringent inspections in order to be licensed as ecotels and this licence is renewed every two years. The Fern-Hotels and Resorts is a chain of hotels that maintain an eco-policy, propagate and oversee a number of ecologically sound activities. They have hotels at Ahmedabad, Bengaluru, Chandigarh, Kochi, Jaipur, etc. The Fern chain of hotels and resorts has made a commitment to protect and alleviate environmental degradation through various means. The focus remains primarily on controlling wastage of water and energy, educating their staff to work as a team on environmental projects and enabling the community in the vicinity to work towards similar ecology protecting goals. A ‘Green Team’ is appointed, comprising of one member from different spheres of hotel management. This Green Team, headed by a manager, see to the environment related projects. Guests are equal partners in the venture of saving the planet. Hotels and resorts in general generate tremendous amounts of waste and the average hotel purchases in one week the same quantity of products that a hundred families would in a year. Therefore, the environmental impact is far greater by way of garbage. To remedy the situation, suppliers are educated about the eco-policy of the hotels and hence products are ordered in bulk, reducing packaging waste. Plastic packaging, though used minimally, is returned to suppliers along with cardboard boxes and other packaging. The rubbish is separated as wet waste (black bins), biodegradable-recyclable waste (green bins), non-biodegradable-recyclable waste (white bins) and non-biodegradable-non-recyclable (red bins). Wet waste then finds its way into the vermicomposting pit. Where water conservation is concerned, they follow drip irrigation. Here only the base of the plants is watered rather than the canopy. The hotels have sewage treatment plants, which allow treated waste water from the hotels to be used in horticulture and in the cooling of air conditioners. Taps have automated sensors and have aerators that restrict the flow of water. Concealed cisterns with dual flush ensure stoppage of unnecessary flow of water. Guests can place tent cards on their beds to indicate that they do not want their linen replaced, in an effort to conserve water. The rooms have an eco-button that increases the room temperature by 2 degrees Celsius, thus saving energy. The guests are invited to plant saplings in the already verdant environs of the hotels. In terms of energy conservation, the minibars have ‘fuzzy logic’ that gauges the number of items in the bar and cools accordingly. Double and triple glazed windows help reduce heat caused due to solar radiation and so reduce the use of electricity. CFL or PL bulbs that give more light and save energy are also utilised. Aside from these efforts, there are visits from schools and the imparting of environmental education to school children. Other activities are organised by the hotels such as paper presentations, planting of saplings, quizzes, debates, poster making, slogan writing – all revolving around environment based themes. Although the concentration is much on ecological preservation, the comfort and satisfaction of the customers is not comp romised in the least. 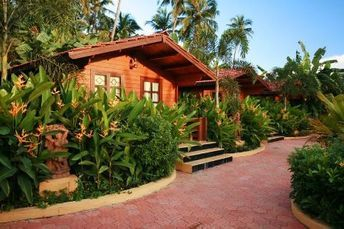 The rooms are built as quaint, wooden cottages set in a tropical paradise. They move up in expense and luxury starting with Winter Green, Fern Club and Hazel Suite, which is the presidential suite. Dining at the Azolla Restaurant will allow guests to partake of Goan, Indian and Continental cuisine. Conscientious followers of eco-tourism will find it an economically feasible alternative as well. The Fern Gardenia is deemed to be the ideal destination for families and couples according to Tripadvisor.